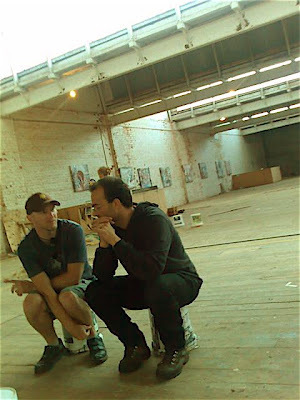 A PHOTO OF JAMES ROBINSON AND I SITTING ON BUCKETS AT HIS OPEN STUDIO AT THE START OF MARCH. TOMORROW NIGHT, JAMES' TYLEE COTTAGE RESIDENCY EXHIBITION 'THE LIGHT' OFFICIALLY OPENS AT THE SARJEANT GALLERY, WANGANUI. HE ALSO HAS AN EXHIBITION ON AT MARK HUTCHINS GALLERY IN WELLINGTON.